Everyone has something they are passionate about, and the School of Arts and Letters at Truman encourages you to pursue your passion through rich academic and artistic experiences that help you reach your professional goals. As part of this dynamic, engaged community of learners, you explore the ways people have sought to express themselves and the world around them as you develop your own talents to make the world a better place. The Department of Art offers aspiring artists a plethora of degree options to help cultivate skills and interests while preparing students for success in jobs markets or graduate school. The Department of Classical and Modern Languages undergraduate program immerses students in language, culture, history, and literature to help achieve native-speaking proficiency. The graduate program prepares students for successful and meaningful careers in education. The Department of Theatre offers students a comprehensive understanding of the literature, cultural context, and history of theatre and extensive practical application in acting, design, tech, and directing. The University Orchestra collaborated with six guest musicians from the Boccherini and Puccini Conservatories. 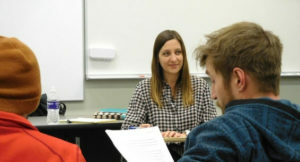 Laura McHugh, mystery author and Truman alumna, came back to campus for a Clayton B. Ofstad Reading Series presentation and to teach a mystery writing workshop. Josh Winkler, internationally exhibiting artist and printmaker, shares his work and process with Printmaking I students. The Society for Sino-American Studies held a Chinese New Year Celebration to help usher in the Year of the Dog. Students in Intermediate Drawing Exploration worked from still-life objects generously loaned by the Biology Department. Our engaged learning community provides a place where you can express yourself and pursue your passions. Discover art studios, music rooms, theaters, classrooms and study areas that inspire creativity and collaboration. And build relationships with mentors who can guide you as you learn useful information and insights. The Fine Arts Center in the Ophelia Parrish Building is home to the School of Arts and Letters and serves as the hub for Truman’s art, music, and theatre programs. Here you will find beautiful performance and gallery spaces, including the James G. Severns Theater, a 240-seat courtyard theater. There’s also a 500-seat performance hall that has fantastic acoustics and is perfect for vocal and instrumental recitals. You can find faculty and student works on display in the University Art Gallery. The newly renovated Baldwin Hall houses foreign language computer labs and tutor rooms, music practice rooms, collaborative study rooms, classrooms and more. This building houses a number of departments including the Classical and Modern Languages, Creative Writing, and English, Linguistics.